In a week when you’ve created social havoc with Louis Walsh for O2 and launched the hottest new cafe to hit the London food scene, how do you top it? You launch a floating house for Airbnb. Naturally. Most readers will no doubt be aware of the Airbnb “A Night At …” events. Basically, money can’t buy experiences where you can have a night at a pretty remarkable venue. We’ve done a ski lift in Courchevel, we’ve done a night at the Maracana and Sepang F1 race track. Lots of fun. Lots of coverage. But then came London’s turn. So to support the brand’s new “Belong Anywhere” UK above-the-line campaign – and to spread the word that regulation changes mean that Londoners can now let out their homes for short periods legally – we wanted something that would be more than just a “borrow a venue you couldn’t otherwise sleep in” stunt (successful though they may have been). Instead, we opted to make one – a whacking great big one as it happened. Not just a formidable launch story for the UK and Airbnb’s markets around the world, but also a brilliant piece of natural media. So we made a floating house. Today came the moment that it made its debut, heading up the River Thames on its maiden voyage to launch the whole thing. The coverage has been pretty formidable already. We’ve landed the Evening Standard (it was the most read piece on the site today), Daily Mail, Daily Telegraph, The Guardian, METRO, Daily Star, Daily Express and Daily Mirror. So a pretty much clean sweep then. There’ve been hundreds of online pieces beyond the nationals of course, everywhere from Time and Time Out to Huh, HypeBeast and HuffPo to the Irish Independent, Belfast Telegraph, the P&J and the Daily Record. It has, basically, rocked. Then we’ve seen some top class coverage across the techie titles that love an Airbnb story. The likes of Mashable (with just over 1,100 shares so far), WIRED, Engadget. Then the boat house hit the design sites in spaces too. Just a couple of highlights including Design Taxi, PSFK, It’s Nice That, Creative Review and Design Boom – stunning write-ups of course. National print coverage came courtesy of The Guardian, Daily Mirror, the Evening Standard, i, The Sun, The Times and Daily Express – all stunning pics with most bagging us half pages. Not a bad haul. 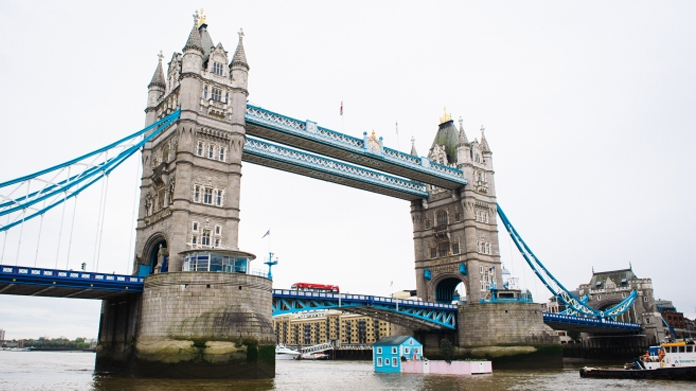 With the floating home hanging out in the City for the next few weeks, we’ve got plenty more to do with it – including a pretty awesome party aboard it on Wednesday and an Instagrammer tea party to follow. So keep your eyes peeled for a sighting – and more coverage to come, of course.